The second Manawanui was laid down on 8 December 1978. This ship was a lead-ship of an Inshore Patrol Craft type based on the 1970s RAN torpedo recovery vessel although it was built with a larger superstructure. In March 1988 the RNZN purchased a larger diving tender due to the expansion of the Operational Diving Team. This new vessel was commissioned into service as HMNZDT Manawanui III. Commissioned: As HMNZDT Manawanui 28 May 1979 (pennant A09), renamed as HMNZS Kahu 17 May 1988 (pennant A04). The first vessel that used the name Manawanui was a tug that operated with the RNZN. The second Manawanui was built at the Whangarei Engineering and Construction and laid down on 8 December 1978. This ship was a lead-ship of an Inshore Patrol Craft type based on the 1970s RAN torpedo recovery vessel although it was built with a larger superstructure. It was completed on 23 May 1979. 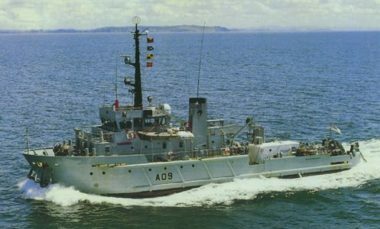 She was commissioned into RNZN service as the diving tender HMNZDT Manawanui on 28 May 1979. Under this name the ship served until 1988. It assisted the recovery efforts on the sunken Soviet liner Mikhail Lermontov in March 1986. On 17 May 1988 the former Manawanui was recommissioned into RNZN service as HMNZS Kahu. In 1990 Kahu was part of the RNZN fleet present at the Waitangi Celebrations. In March 1988 the RNZN purchased a larger diving tender due to the expansion of the Operational Diving Team. This new vessel was commissioned into service as HMNZDT Manawanui III. She was formerly known as the Star Perseus and had been used as a diving support vessel for North Sea oil rigs. Combined with the Naval Hospital this vessel provided a wide range of civil services in addition to its prime function as diving tender, mine countermeasures and underwater research. The vessel is fitted with a 250 feet compression chamber and a wet diving bell. Also fitted is a 13 tonne crane, a workshop which included electric and gas welding equipment and a lathe. There is a photographic darkroom, air compressors, a self-tensioning mooring capability. The afterdeck can carry 150 tonnes of equipment if required. Manawanui was docked in Dundee. The ship’s company had come over in March and began the hard task of cleaning up the ship after five months of being laid up. The project was under the control of Ocean Fleets Ltd. The ship’s crane rescued a catamaran that was overloaded with truck tyres taken from the ship. The kiwi on the starboard funnel was reversed so it faced backwards. Her Commissioning ceremony was held on 5 April 1988. Assistance provided by HMS Camperdown (Dundee RNVR Division) . Present at ceremony were Commander D.A. Cootes, Commander D.N. Wood, the appointed CO of Manawanui. At the ceremony the ship was presented with a miniature brass and copper diving helmet from Ocean Fleets Ltd. This was a speedy project as only a few weeks lapsed between the selection of a diving support vessel, its purchase, transporting the ship’s company, storing ship, sea trials and preparation for the return voyage to New Zealand. This was commented upon by the RN as an example of Kiwi can-do attitude. Is swarmed over by local officials that the CO concluded included the secret police, hawkers, pedlars, gully gully man – lack of “gifts” to local officials was the source of some problems. Rat guards made out of a 44 gallon drum – Suez canal light weighing 1.5 tonnes wrestled into place by the ship’s company. Successfully for the first time supplies three working divers supplied by the one air system. Dive bell operated successfully 18/9/89 – another first was a dive to 50m at Gannet Rock by three members of the ODT – diving using Heliox equipment – the LP system could supply three divers with air at 50m but they could not do any work. [m] Began search for anchor 2-10-89 – could not search at 53m needed ROV and extra tanks. – resumed 3-5/10/89 failures of kit prevented the anchor being found anchor replaced 6/10/89 – diving equipment removed and computers added for operations with the RNZIR and UKSAS. 17 October do recovery of airdropped supplies, boats and their crews – using [m]’s four Zodiacs. To 30 minutes to safely recover men and boats except one boat that had drifted downwind and was recovered later. Ship makes passage in darkened condition – off Stephens Island – embarked a reconnaissance party under the command of a US Army Captain in two boats. Difficult job in 3m swells close to the cliffs to avoid sighting by the opposition. The exercise went very well as the crane operator and dive deck crew learned very quickly to be effective. Makes passage to Matai bay to contribute to Exercise Normandy – landing exercises with NZ Army/SAS teams in Nydia Sound – have to deal with civilian boats as it is labour Weekend 1989. At Deep Bay – platoon used 4 [m] to carry out the landing exercise – at Harvey bay platoon picked up – fully armed and camouflaged, shocks the locals who had no idea the men were there. In 1998 she was tasked to the Solomons Islands. She was sent to Bougainville to clear possible underwater obstructions in Loloho Harbour. She also carried the Truce Monitoring Team to areas accessible only by sea as part of the peace negotiations following on from Operation BIG TALK. Her predecessor Manawanui II assisted the recovery efforts on the sunken Soviet liner Mikhail Lermontov in March 1986. By 1996 after various attempts to negotiate peace in Bougainville, the New Zealand Government hosted a series of talks by the warring parties, and in 1997 a truce was negotiated, with an unarmed New Zealand-led multi-national Truce Monitoring Group (TMG) inserted into the island. RNZN personnel were assigned to the TMG. Canterbury, Endeavour and HMNZDT Manawanui[i] were deployed to assist the insertion of the group. After the arrival of the ships the initial tensions gradually disappeared and the main task of the ships was to land personnel to get things working after years of neglect and damage. This ranged from such jobs as repairing the power supply and rebuilding the local school. During 1998 and 1999 Manawanui undertook two more deployments to Bougainville. During June 2000 communal conflict on Guadalcanal Island led to a breakdown of law and order. While a combined Australian and New Zealand air and sea evacuation of nationals was arranged, Te Mana was diverted to the island to support the operation. Her ship’s company operated the airport during the airlift, while the ship provided radar control for the evacuation aircraft. Subsequently Te Kaha relieved Te Mana at Honiara, and in September Te Kaha returned to be the venue for initial peace talks. Ultimately the talks were completed in Townsville, Australia, which led in December 2000 to the insertion of a small International Peace Monitoring Team and RNZN personnel are assigned to this mission. The IPMT was supported by the RAN and in October 2001 Manawanui deployed to the islands for an eighteen week attachment to the IPMT. During that time elections were held and Manawanui played an important role in transporting election monitors and assisting the newly-formed government. The RNZN was only able to take part in peacekeeping operations as its fleet was developed and it is to that development that this chapter now turns. She sailed at 0800 the week ending 24 February 2012 in support of the Defence Force sponsored Operation Hero television programme. Following a two point anchorage, rendezvoused with Philomel (PHL) boats, the television crew and the six children at approximately 1200 yards off Army Bay, Whangaparaoa. We were expected provide the military platform for the children to enter the water from, prior to commencing their swim to Army Bay. Although a relatively short serial, the need to maintain a military unit in camera shot throughout the swim and further beach activities, meant that we did not weigh anchor until approximately 1230 so as to head towards our home port Whitianga. The highlight of April 2012 is without doubt the ship’s involvement in the Whitianga and Martarangi ANZAC commemorations. All the ship’s company were justifiably proud and certainly came back more unified than prior to departure. Finally on 24 September 2012 Manawanui was called into assist when a Fuller’s ferry enroute to Whangaparaoa suffered a fire in the Rangitoto Channel with 63 persons aboard. Along with Deodar the ferry was escorted to Gulf Harbour. R.J. McDougall, New Zealand Naval Vessels, Christchurch: GP Books, 1989, pp. 136-137. She was renamed Kahu in 1988.